Defying the Trump administration, Turkey said it would ignore the State Department’s call on US allies to stop importing Iranian crude oil by November 4, when the latest sanctions against Iran are set to kick in. Earlier this week, the State Department called on all US allies to completely stop buying Iranian crude, sending the price of oil to 4 year highs in the process. While many are trying to find a way around the sanctions, it is for now proving tricky, and many buyers are winding down their purchases of Iranian crude. "The decisions taken by the United States on this issue are not binding for us. Of course, we will follow the United Nations on its decision. Other than this, we will only follow our own national interests,” Turkey’s Economy Minister Nihat Zeybekci said according to Turkish daily Hurriyet, adding that “we will pay attention so our friend Iran will not face any unfair actions." Turkey is hardly alone in its defiance: oil importers including Japan, South Korea, and India, as well as European countries have said they will continue buying Iranian crude, although whether they will really do that remains to be seen - French oil giant Total has already stopped purchasing Iranian products. The European Union is particularly concerned about the situation because not only because it relies on substantial Iranian imports, but because there is only so much that the three European signatories to the Iran nuclear deal could do to prevent Tehran from exiting it, which might happen if it stops seeing benefits from it, President Hassan Rouhani said. The nuclear deal, which Iran signed with the US, France, Germany, the UK, Russia, and China, ended the international sanctions that Iran was subjected to because of its nuclear program, and gave it access to international markets, especially oil markets. Yet, if the unilateral US sanctions lead to a closure of this access, Iran will indeed be locked out of any economic benefits from the nuclear deal. Although Tehran still maintains that the nuclear program was not geared towards the weaponization of uranium, Rouhani—and Ayatollah Ali Khamenei before him—said Iran will ramp it up if the deal with the West falls through. There is another notable consideration: Last Friday during Friday's OPEC meeting, Iran'ss petroleum minister said he wants to increase exports of Kirkuk's oil 10-fold to 300,000 barrels per day. "We have started to receive the Kirkuk oil to Iran. I hope to be able to continue it as the program we have agreed to with the oil ministry of Iraq," Iranian Minister Bijan Namdar Zangeneh told Rudaw on Friday. "But for continuation of this swap, and to we need to increase the level of this swap, we need to build a pipeline between Kirkuk and Iran," emphasized Zangeneh. "Currently it's at 30,000 bpd, could be increased it to more than 300." Iraq's State Organization for Marketing of Oil (SOMO) currently sends Kirkuk oil by tanker truck to a refinery in Kermanshah. In return, Iran sends the same amount of oil to southern Iraq. Iraqi Oil Minister Jabbar al-Luaibi reiterated to Rudaw at OPEC that talks are underway between all players to re-open the Ceyhan pipeline. 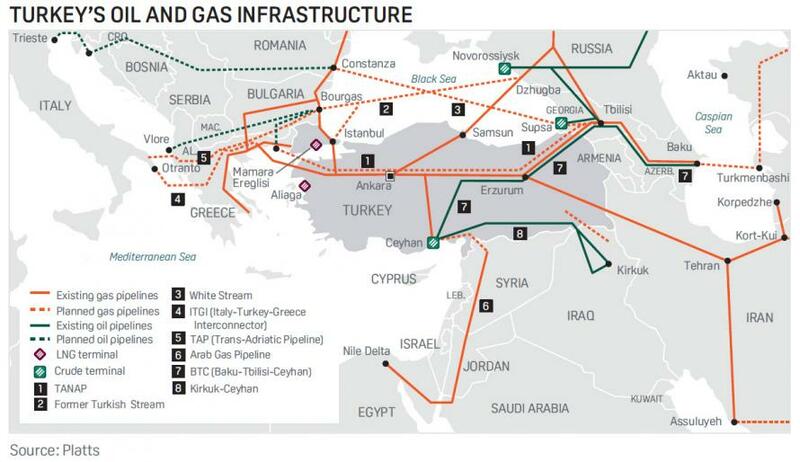 "The pipeline is owned by Rosneft, BP, and a Kurdistan Region company. Now we are in talks with them and God willing this issue will be resolved. Talks with Rosneft, BP and the Kurdish company are ongoing," Luaibi said. Should the Ceyhan pipeline to Iran be completed, and Tehran get access to Turkish export markets, then US attempts to limit Iranian exports would be substantially diluted. Iran has another potential white knight: According to Jefferies analysts, with Chinese oil demand set to expand by 1 million b/d this year and more next year, the country can mop up whatever Iranian barrels others leave due to U.S. sanctions. "While some buyers have cut purchases from Iran in fear of losing access to U.S. markets and dollar settlement systems, they are doing so grudgingly and resentfully." In 2017, China imported ~650k b/d from Iran in 2017 -- 5.1% of its total demand and 7.4% of imports; notably, this was down from 13% in previous years. In other words, if the trade war between China and the US indeed escalate, China would be more than happy to shift excess demand to Iranian exports, while leaving some legacy producers in the cold.